Recent changes in China’s labor market have underscored the importance of having both an efficient HR system and a satisfied and reliable workforce, and the HR audit is a useful tool to ensure this. 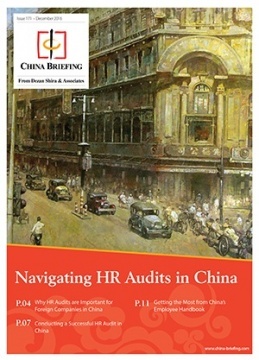 In this issue of China Briefing magazine, we provide a guide for conducting HR audits in China. We analyze why the HR audit is especially important for foreign companies operating in the country, and then detail the different HR audit models and procedures that are available to firms. Lastly, we explain how the employee handbook can serve as a year-round safeguard against labor disputes in the Middle Kingdom. Labor dispute and industrial action cases have continued to rise in China over the past two years. In 2015, new labor disputes in the country amounted to 483,311 – an increase of 25 percent from 2014 – while strikes and protests in the first half of 2016 rose almost 20 percent compared to the previous year. There are a myriad of reasons for these developments in China’s workforce, but the most commonly cited causes are the changing nature of the Chinese economy, as well as its recent slowdown, and rising wage expectations. Traditionally, disputes and strikes in the country spike just before Chinese New Year holidays and then soon peter out, but since 2015 – when problems in the economy became especially apparent – they have become a regular feature throughout the calendar year for both foreign and domestic companies alike. These changes in China’s labor market have underscored the importance of having both an efficient HR system and a satisfied and reliable workforce, and the HR audit is a useful tool to ensure this. HR audits identify problems in a company’s HR policies, documentation, and procedures to mitigate against employee dissatisfaction and legal non-compliance. For foreign companies unfamiliar with China’s idiosyncratic and ever-changing regulations and market trends, they can be essential. In this issue of China Briefing magazine, we provide a guide for conducting HR audits in China. We analyze why the HR audit is especially important for foreign companies operating in the country, and then detail the different HR audit models and procedures that are available to firms. Lastly, we explain how the employee handbook can serve as a year-round safeguard against labor disputes in the Middle Kingdom.